I'm adding fried rice to my easy go-to dinners. My favorite part . . . it is even better if you use day old rice. So bust out your left over rice, and get ready! Another quick tip from this great guide: don't touch it too much. Poking at the rice will break the grains, releasing starch and making it more 'mushy' than you want. 1. Heat 1 tabelspoon cooking oil in large sauté pan on high heat. 2. Add the shrimp, let fry, untouched for 30 seconds. Flip over and let the other side fry for 30 seconds, or until about 80% cooked through. Remove the shrimp from the pan onto a plate. 3. Turn the heat to medium, and add the eggs. Stir quickly to scramble until they are almost cooked through. Remove eggs from pan and keep on the same plate as the shrimp. 4. Use paper towels to wipe the sauté pan clean and return to high heat with the remaining 1 tablespoon of cooking oil, swirling to coat. When the oil is very hot, add the green onions and fry until fragrant, about 15 seconds. Add in the rice and stir well to mix in the green onions throughout. Spread the rice all around the wok surface area and let the rice heat up, untouched until you hear the bottoms of the grains sizzle, about 1-2 minutes. Use the spatula to toss the rice, again spreading the rice out over the surface of pan. 5. Drizzle the soy sauce all around the rice and toss. 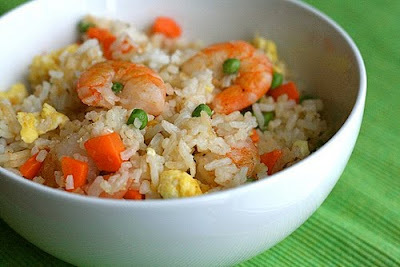 Add the peas and carrots, the cooked eggs, shrimp and sesame oil, tossing to mix the rice evenly with all of the ingredients. Let everything heat back up again, until the rice grains are so hot they practically dance! Taste and add an additional 1 teaspoon of soy sauce if needed.